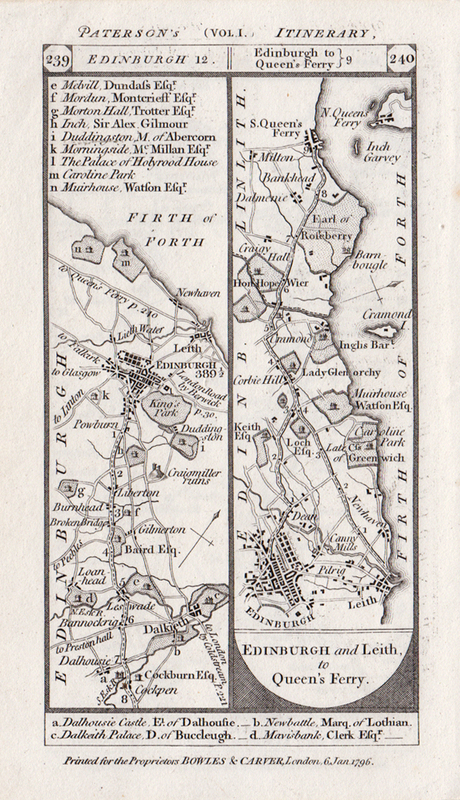 Daniel Paterson - Road from Edinburgh and Leith to Queens Ferry. On the verso the road from Hawick to Selkirk, Bank House to Middleton to Edinburgh. The Road from Edinburgh and Leith to Queens Ferry. On the verso the road from Hawick to Selkirk, Bank House to Middleton to Edinburgh. Published in 'Paterson' s BRITISH ITINERARY being a new and accurate Delineation and Description of the Direct and Principal Cross Roads of Great Britain in two volumes by DANIEL PATERSON Esq.' Published by Bowles & Carver in 1800.